Warm salads are excellent go-to side dishes in winter, providing interesting contrast to a hot entree. 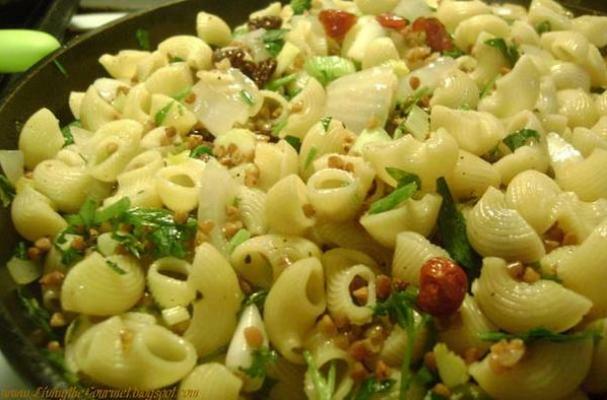 Warm pasta salad recipes like this one include perfectly cooked noodles, interesting mix-ins and mildly flavorful dressings. Try this delicious warm macaroni salad with barley, dried cranberries and a lemon-honey dressing. Cook macaroni as directed drain and set aside. Prepare the barley as directed, drain and set aside. In a large frying pan drizzle a little olive oil and heat. Add the onion, parsley, garlic and scallions. Sauté until the onion is clear. Add the macaroni, barley and raisin cranberry combo to the pan and toss.